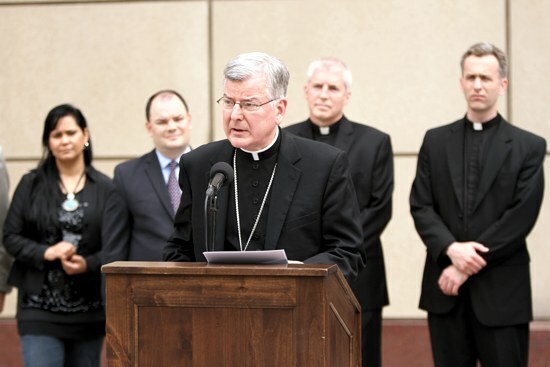 Archbishop John Nienstedt speaks at a press conference June 26 in Minneapolis announcing a joint statement from Minnesota faith leaders on federal immigration reform. “The Roman Catholic bishops of Minnesota as well as bishops from around the United States have long been concerned about the nation’s immigration policy. It is inconsistent, ineffective and fails to promote the common good. Therefore, we stand today, united with Christian brothers and sisters from across the communities and denominations, to reiterate our support for comprehensive immigration reform that brings millions of people out of the shadows, reunites them with their families and puts them on the path to citizenship. Each day in our parishes, social service programs, hospitals and schools, we witness the human consequences of our broken immigration system. Families are separated, workers are exploited and our fellow human beings die in the desert. Without positive change to our immigration laws, we cannot help these people who are our brothers and sisters. Every immigrant is a person — a daughter, son, mother or father — who possesses fundamental, inalienable rights that must be respected by everyone. As Christians, we have a responsibility to welcome the foreigner out of charity and respect. Supporting legislation that helps repair our broken immigration system is part of this responsibility. We recognize that finding solutions to the plight of immigrants today will sometimes necessitate the overcoming of boundaries in the heart, not just on the land. Before a gate finds its way into the walls outside, there must be a gate that opens in the heart. This is what the Good Samaritan did: He gave the assistance that was demanded of him by the universal law of love — the law of our common humanity — by supplying a basic human need to a poor stranger. Like the Good Samaritan, we must see all people, including immigrants and undocumented workers who may be different from us, as human beings made in the image and likeness of God, and fashion our response to their needs accordingly.